Avalanche in their last Stadium Series game in 2016. Credit: Isaiah J. Downing, USA TODAY Sports. In 2020, the state of Colorado is hosting something special. Well, really it’s the city of Colorado Springs and the Air Force Academy, which is hosting the 2020 NHL Stadium Series game outdoors at Falcon Stadium. And as of Friday, we now know the Avalanche will be hosting the Los Angeles Kings. The date of the matchup is still not known, but what we do know is that it will be the seventh straight year of the Stadium Series and that game will be the 11th all-time. Starting back in 2014, the NHL decided to start playing games outside at other sports’ stadiums. 2014 saw three games played, at Dodger Stadium and Yankee Stadium of the MLB as well as Soldier Field in Chicago, home of the NFL’s Bears. 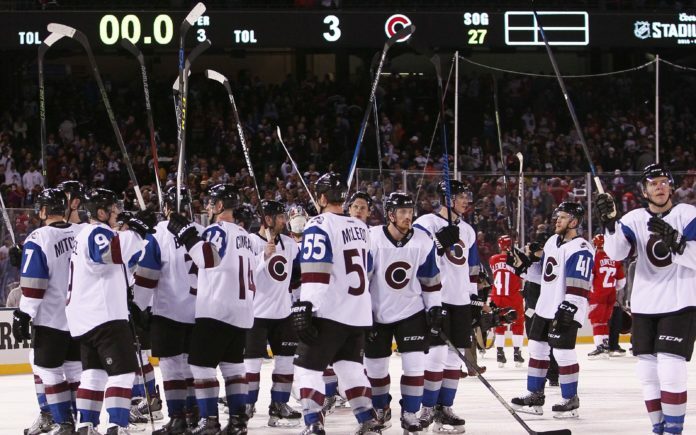 Every other year in the series has featured one game except the 2016 season, in which the Avalanche hosted the Detroit Redwings at Coors Field in Lower Downtown Denver as part of two contests. 50,095 people attended that Avs-Redwings game at Coors which saw Detroit win 5-3. Falcon Stadium was completed in 1962 and has been home to the Air Force Falcons team since then. The Falcons compete in the Mountain West Conference with fellow Centennial State school Colorado State and their home is the second-highest college football stadium in the country in terms of elevation at 6,621 feet above sea level. Falcon Stadium’s capacity comes in at 46,692 and this will be the first-ever ice hockey game the ancient arena has hosted. Currently, the Avalanche are tied for fourth in the Central Division at 22-20-8 with 52 points on the season. The Kings are currently last in the Pacific Division, at 20-26-4 this year. And Colorado sports three All-Stars set to compete both in the NHL Skills Competition Friday night (7 p.m. MT, NBCS) but in the All-Star Games on Saturday, too. Nathan MacKinnon is part of the fastest skater competition, Gabriel Landeskog will be in the premier passer competition and in puck control it will be Mikko Rantanen. Then, the Central takes on the Pacific at 6:15 p.m. MT before the final game sees puck drop at 8:15.